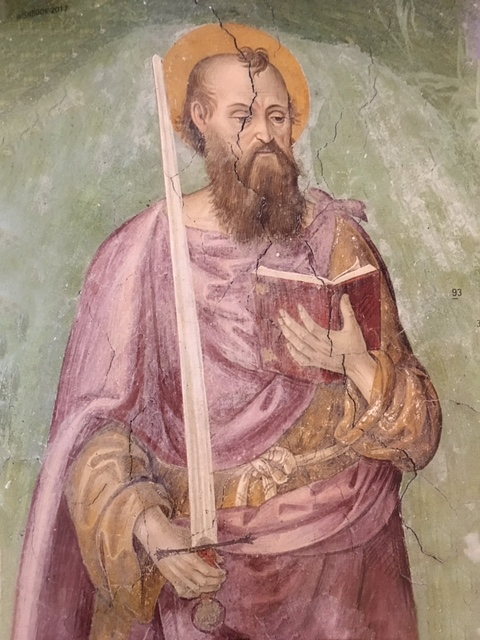 The fresco is located in an area of the Basilica of St. Paul Outside the Walls, accessible by way of Via Ostiense. Paul, the Apostle of the Gentiles, is rendered with his characteristic beard and elongated proﬁle. He is reading a book, opened in his left hand, while his right hand wields a sword. The weapon is typical in iconographic depictions of the saint, who upon his conversion, no longer persecuted the Christians. Instead, he fought for their salvation and was eventually martyred, beheaded by the sword. The state of the fresco is really delicate. There is oxidation and aging of the varnishes, dust and dirt on the overall surface. In some areas the color is detached. Touch-ups from the past have been identified on different areas. The whole surface needs to be fixed. Restoration includes: consolidation of the support; removal of oxidized varnish and of previous restorative interventions; cleaning and consolidation of the pictorial surface; photographic documentation; and application of protective varnishes. Restoration cost is $46,150.